Just make this please! Press print below… Enjoy!! Heat the vegetable oil in a large soup pot over medium high heat. Saute onion and ginger until onions are soft and translucent. Add the curry powder and salt and cook, stirring for another minute. Add the chopped sweet potatoes, coconut milk and vegetable stock, then bring to a boil. Reduce the heat to medium and simmer for 10-15 minutes until sweet potatoes are tender when pierced with a fork. Puree mixture in a blender or food processor until thoroughly combined. Return mixture to the burner, bring back up to simmer and stir in lime juice. Adjust seasonings if needed. (I used a vita-mix and it worked great at getting this soup a beautiful consistency) Transfer to bowls and garnish with cilantro, thai basil, salted peanuts and a drizzle more coconut milk if desired. Evelyn~ Have a blast in Tahoe! This looks amazing! I can’t wait to try this recipe, especially as the temperature starts dropping. Maybe we can make it around Christmas-time at the Bittner residence! What do you say, Jenny? I say “yes” ! Sounds like fun Puja!!!! Krista…Puja and I will definitely make this soup! Looks fabulous! Fall is my favorite time of year too ! I can’t wait to try your wonderful autumn soup ! Thank you for the inspiration and recipes . You are an amazing young lady ! Yum! 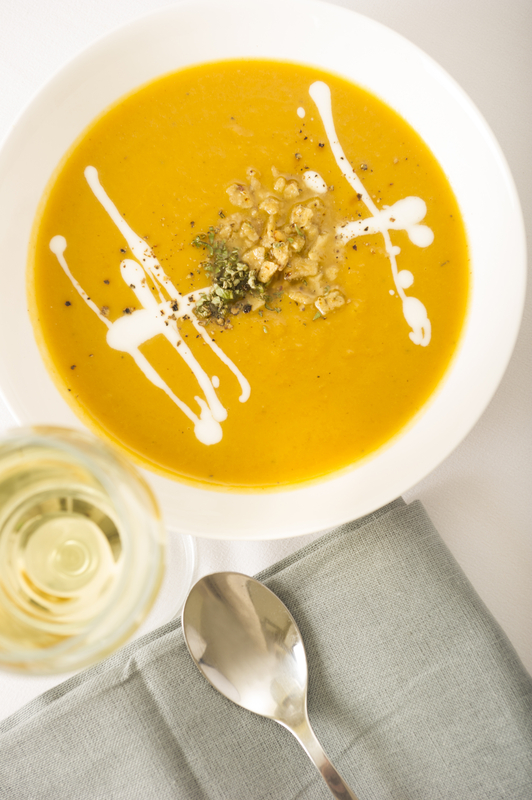 Looks like the perfect almost-fall soup! Peanutbutterandellie~ Thanks for stopping by!! Hi Krista! This soup has all my favorite ingredients and I can’t wait to try it. I feel comforted already just thinking about it….yum! So glad – thanks Angie!